There's nothing quite like enjoying the fruits of your labors. Sitting on your front porch, looking at the beautiful garden you planted and running your toes through the thick green grass in your front yard is a great way to pass the time... except when your lawn isn't green. Brown, dying grass can be frustrating, especially after you've put in the work to weed and mow it all year long. Before you can treat your brown grass issues, it's helpful to know why it looks dead. Type of grass: Grasses like Bermuda grass and St. Augustine, grow better in warmer soil. Warm soil is essential to green up these grasses. It's not outside temperature, it's the temperature of the dirt. But, grasses like fescues, bluegrass and ryegrass do better in spring and fall. They won't grow at all during the winter but summer heat is even worse on the grass. They need extra water during hot months to keep them cool. Water: If your grass is brown when it should be green, you may not be adding enough water. Dig up a few areas of grass and check the soil about 4-inches deep. The soil should still be moist. If it's dry and hard, your grass isn't getting enough water. Bugs/Disease: Disease happens earlier in the season. Bug problems typically occur after the weather has warmed up significantly. While bug damage can resemble disease-related damage, if it occurs later in the spring and summer bugs are probably the culprit. Dig up a patch of grass and look for bugs or worms. 1. Get rid of dead grass from the lawn. 3. Apply grass seed to your lawn. 6. Mist the area with a hose. Too much water will wash the seeds away. Keep the area moist as the seeds take route. 7. To keep grass healthy, mow your lawn as short as possible at the end of fall. Refrain from fertilizing until the next spring. -Remove weeds frequently. 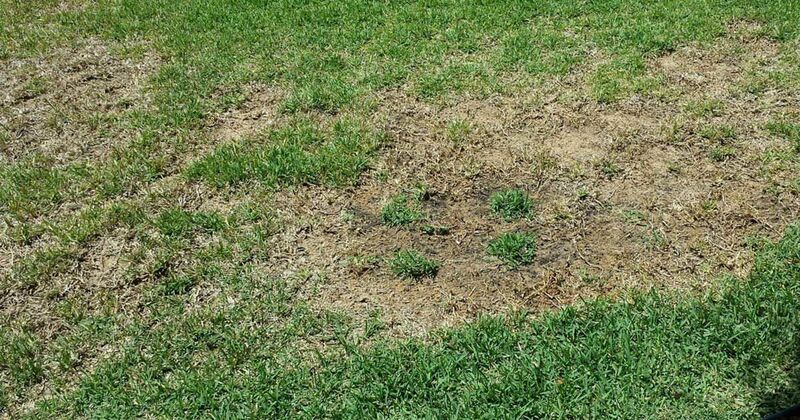 Weeds can take over your lawn. Herbicide can help control persistent growth. -Consider lawn aeration. This will help the roots of your grass get enough oxygen to promote healthy growth. Aeration is also an excellent way to help get rid of diseases that could be ruining your grass, according to House Logic. -Pay attention to your pets. Animal urine can kill grass fast. Make sure to hose areas that your dog favors to keep the acidity from killing your grass. You work hard to keep your home and yard tidy. A few extra steps can help ensure your lawn looks beautiful and healthy. Make sure to share these helpful tips with your friends on Facebook and feel free to share your tips in the comments below!